A drill rig assistant suffered a blow to the head and an injured knee when the drill rod he was helping to support suddenly fell to the ground. A dual tube reverse circulation (RC) drill rig was tripping drill rods using the main winch and hoist cable attached to a ‘clamshell’ or sliding saddle from which a wire rope is run to a hook. Both the clamshell and the hook have handles for manually controlling the apparatus. This system (or variations of it) is standard practice in the industry. 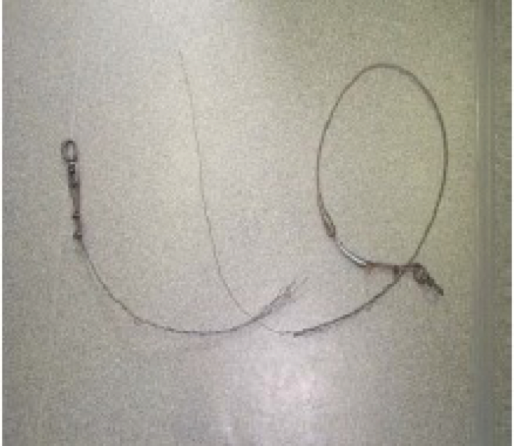 The incident occurred when the wire rope attaching the clamshell to the hook broke causing the drill rod to slide through the clamshell and fall to the ground. The drill rig assistant had hold of the handle on the hook which dragged him down as the rod fell causing him to strike his head against the drill rod. As he collapsed, he also knocked his right knee on a metal guard on the ground. The drill rod came to rest against the mast having fallen onto and through the steel working platform– Figures 1 & 2. The wire rope used was an 8mm, 6x6 rope (6 strands each made up of 6 wires), with a mean breaking load of 4 600kg Figure 3. This cable is intended for use as wireline rope on diamond drill rigs and not as a lifting cable although the practice of using the readily available wire line rope on multipurpose rigs is common. The wire rope was fitted with swivels at both ends and the rope was terminated with Crosby clamps. The drill rod was a 4” diameter x 6 meter long and had a mass of approximately 160kg. The main winch of the drill had a single line capacity of 10MT and no load limiter was fitted to the winch. It seems likely that the wire rope had been overstressed at some time possibly due to the hook or clamshell being caught on a part of the drill rig. Since the main winch is capable of exceeding the rating of the wire rope and no load limiting device was installed on the drill, it is possible that the overstress could have caused even by a relatively small overload. Almost all rotary percussion and reverse circulation drill rigs use a clamshell arrangement to trip drill rods and so the potential for this accident to be repeated is very great indeed. It is therefore recommended that 10mm or 12mm wire ropes only are used. The main winch should not be used for rod tripping – instead the auxiliary winch should be used. All elements of the clamshell, wire rope, swivels, shackles and the winch must be fully inspected on a daily basis. All elements of the rod tripping equipment must be manufactured to an acceptable technical standard and must be permanently stamped with the safe working load of the piece of equipment.